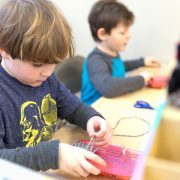 Subject: Montessori in the 21st Century – Given that we cannot predict the skills needed for tomorrow, it is important that our students know how to learn and adapt; we want them to have the ability to analyze, synthesize, and utilize information. The world is rapidly changing. Join us on January 17 from 5:30-6:30 as we look at the skills needed to be successful in this world and how Montessori best prepares your child for whatever this world is bringing. When: Thursday, January 17, 2019 from 5:30-6:30 p.m.